Ang Boracay ay isang tropikal na pulo na tinatayang matatagpuan 315 km (200 milya) sa timog ng Maynila at 2 km sa hilaga-kanlurang dulo ng pulo ng Panay sa Silangang Visayas sa Pilipinas. Isa ito sa mga sikat na destinasyon ng mga turista sa bansa. Binubuo ang pulo ng mga barangay ng Manoc-Manoc, Balabag, at Yapak (3 sa 17 barangay na binubuo ng bayan ng Malay), at nasa ilalim ng pamamahala ng Philippine Tourism Authority (Autoridad ng Turismo sa Pilipinas) na may ugnayan sa Pamahalaang Panlalawigan ng Aklan. 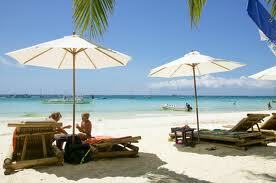 The beaches of the Boracay Island is located off the north-western tip of Panay Island, Philippines. Boracay is world famous and is almost always the first beach mentioned when tourist, foreign & locals alike talk about vacation places in the Philippines. 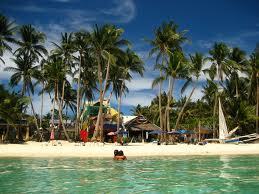 The island of Boracay is 7.5 kilometers long and 2 kilometers wide. The popular powdery White Sand Beach (which take up most of the western side of the island) is where most of tourist go to see and be seen. Boracay Island has electricity and piped water and has grown into an international tourist hub with 20 dive sites, scores of bars and restaurants, native tattoo parlours, banks, a fire department, and a police station. There is also a Tourist Center that also serves as a souvenir shop and an airline reservation center. Aside from scuba diving, snorkeling & sunbathing, a common sight round Boracay Island is sailing on slender hulled boats called Paraw. Passengers occasionally seat on a webbing area between the outrigger supports. The Paraw is exceptionally fast off the wind, but difficult to maneuver, requiring the foresail to be backed. 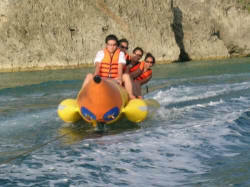 They can be hired for trips round the island, a wonderful experience if you don't mind getting wet. There are three classes of Paraw with size limits on each. Races are regularly staged each year with the winning boat getting a considerable prize. 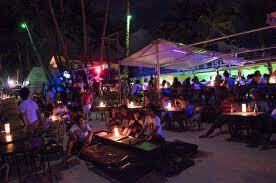 The nightlife of Boracay is very lively with the numerous clubs and bars spanning the whole stretch of the beach. From Friday's at the northern part of the beach to Lorenzo South at the southern end. 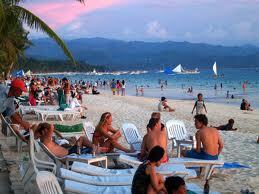 It is specially so during Lent & Christmas season when Boracay Island is transformed into a big fiesta. It is the time when local & foreign tourist come in droves. But whatever season, If partying is your cup of tea, then the nightlife of Boracay is for you. Popular hang outs at the central portion of Boracay strip are: Friday's, Cocomangas, Pier 1 and Hay Jude -just to name a few. To the golf enthusiast, there is the 18 hole, par 72 golf course at Filinvest's Fairways & Blue Waters. It is a first class club and hotel located a short distance from the beach. A nice place to picnic during the day and do some diving or snorkelling is Crocodile Island. There are also Bat Caves to explore on the northeast coast of Yapak and at the southern end of Bulabug Beach, there is Sunken Forest to discover. 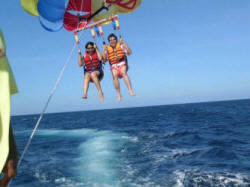 You can reach Boracay Island by air via South East Asian Airlines (Seair). It has regular daily flights to Caticlan (it is nearest airstrip to Boracay). From Caticlan is a short boat ride to Boracay. You can also catch the daily flights of PAL, Cebu Pacific or Zest Airways (formerly Asian Spirit) to Kalibo, Aklan, from the airport, take a 2-hour bus ride to Caticlan, then the short boat ride to Boracay. And if you are not in a hurry, you can take the ferry boat trip from Manila to Caticlan (twice a week - Mondays & Saturdays) of WGA's Supper Ferry. The ferry boat ride takes approximately 15 hours. Another alternative if you are not in a hurry, is to take the Philtranco Bus (tel # 852-2523, 853-3218) from Manila (EDSA, Pasay) to Caticlan then take the short boat ride to Boracay Island.